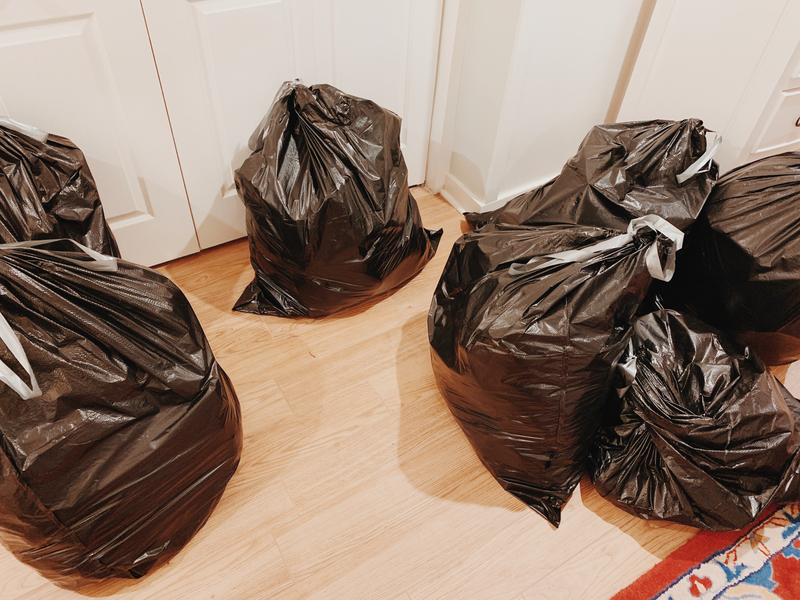 Last week, I shared some background on the KonMari Method and why, exactly, Mitch and I have committed ourselves to a full home clean-out in the first quarter of 2019. If you’re familiar with Marie Kondo and her best-selling book The Life-Changing Magic of Tidying Up (or the new Netflix series on it! ), you probably know that the author places great importance on tidying and cleaning out in a categorial order instead of by going room by room. The first category–and where everyone should start, according to Kondo–is clothing. Before I started the clean-out, I was pretty opposed to the category idea. I desperately wanted to go room by room because I was after an immediate sense of accomplishment and some noticeable, drastic results. Without all that, I feared that I’d lose steam. It was also the only way I’d ever cleaned and tidied before! 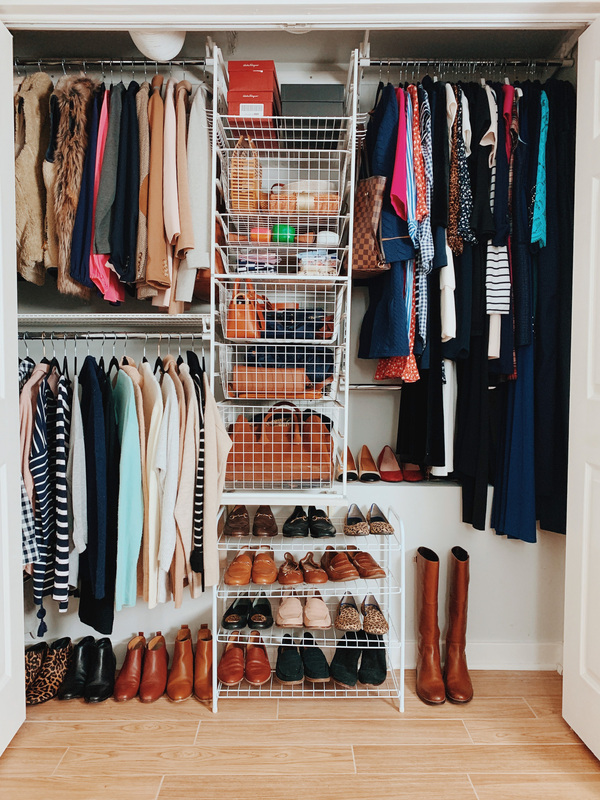 Btw, I covered this in my first KonMari post, but Kondo pushes you to organize, declutter and discard in this categorical order: Clothing, Books, Papers, Miscellaneous (Kitchen, Bathrooms, Garage, Kids’ Stuff, etc. ), and then Sentimental Items. The reason behind this is simple: if you do it by room, you’ll likely find yourself getting distracted, and suddenly hours have passed and you’ve gotten very little accomplished, all because you found an old photo album and got sucked in. 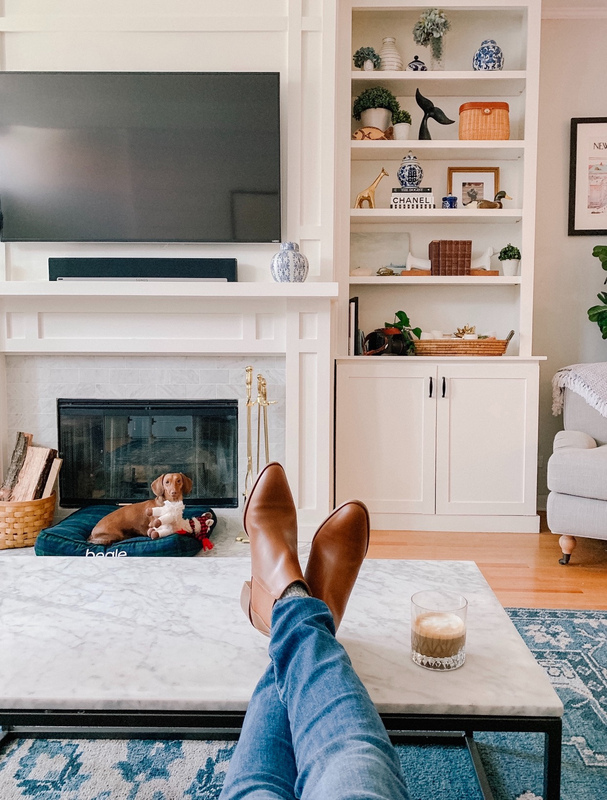 Kondo argues that if you declutter in her order, that you’ll be far better prepared and equipped to tackle the categories that pull on your heartstrings when you get to them. 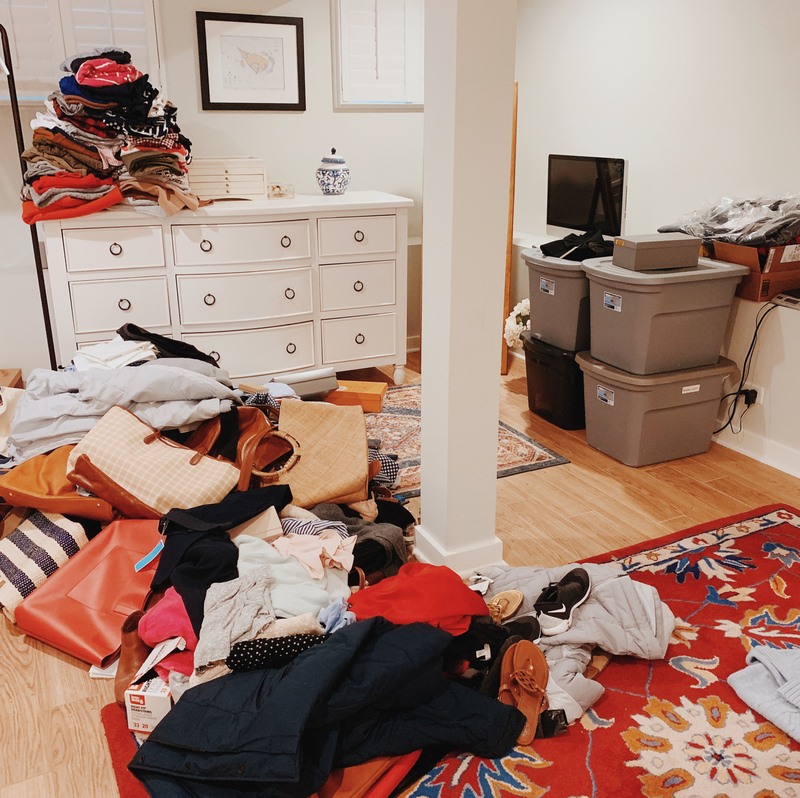 All of that said, I really wanted to commit to the KonMari Method, and by forgoing the whole category thing made it the “Kelly Method,” which had proven to be ineffective. ;) But I kind of needed to get my controlling ways out of my system before submitting to and adopting someone else’s ideas. So in an effort to pocket some “accomplishment energy,” I decided to first tackle a very, very small project–the master bathroom–and then stop and fully commit to the categories. I’ll admit that I felt a little guilty doing this, and I still feel guilty, haha. I mean, I cheated. I should have waited for the Miscellaneous category where bathrooms fall. But it was glorious, and the warm and fuzzy feelings I get from my super tidy and organized bathroom every morning have kept me going. Over the course of roughly 45 minutes split up between two days, I spilled out the contents of the vanity and shelves onto the floor, sent off a ton of unopened toiletries and makeup to a women’s shelter–I highly recommend “Sarah’s Circle” if you’re in Chicago–and kicked multiple garbage bags to the curb. And now I start my day off clear-minded in a place that inspires more KonMari-ing! Getting ready is far more enjoyable (relaxing, even!) and I actually now use the products I decided to keep, which has resulted in me looking and feeling better. The most significant takeaway from the mini master bathroom project has been that I need to be more cognizant of what beauty products I actually need. And the best way I can do this is by having everything that I already own in plain sight, as I’m far less likely to buy more if I’m aware of this. Now, with the realization that the products I own will last me a long time, I’m more mindful. I’ve also promised myself that I’m purchasing zero additional beauty products–with the exception of replacements for high-use stuff like shampoo, conditioner, foundation, etc.–until I’ve used up everything else. I think mindfulness is just something we need reminding of, and I happily carried this with me into the clothing category. Me: I talked about this in my first KonMari post, but good amount of stuff arrives on our doorstep every week because of the blog. Some of it I buy–it comes out of my quarterly budget for product purchasing–but a lot of it is from brands, either because they’re hoping I’ll feature it or because we’re partnering on a project. (Most press packages are unexpected, but I usually see an influx a month or two before upcoming seasons start. So, for example, our UPS and FedEx guys will likely be visiting us a lot in late February/early March, as that’s when companies will want to start promoting spring lines.) This is beyond helpful from a business perspective and it’s not lost on me that I’m very lucky. Dream job, for sure! That said, managing all the stuff takes time, and it can get overwhelming. Before Emma, it was totally doable. (Give the really nice gifted products to friends and family; sell valuable things I purchased on my own; donate everything else.) Now, though, I can barely balance work and motherhood, and the stuff just piles up way too quickly–in the bedroom, office/guest room, and coat closet. And while I’ve always cleaned out my closet once per season, I’m definitely not as ruthless as I should be, since I know I don’t have the time to dedicate to getting the stuff to people who either need it or who will really appreciate it. And even though I don’t need 90 percent of it, so much of it is just so nice that I feel guilty getting rid of it in the first place! The struggle, haha… But yeah. My closet has been neglected for a long time. Emma: Emma does receive quite a bit from brands, but the biggest issue here is that she grows out of stuff so quickly and I’m always behind on sorting through the items and deciding what we should keep and store for Baby #2. (WHICH WILL BE ALL FOR NAUGHT IF THE BABY IS A BOY. ) Half of the stuff in her drawers is too small for her and it’s really frustrating. Gather in-store returns and complete them: I’m ashamed to admit that we had a bunch of returns, one over a year old, just sitting around. Between blog, personal, baby and home stuff, there was a lot! (Maybe like seven different stores we needed to visit?!) Most of it was stuff that didn’t end up fitting or that we didn’t end up using or needing… and I kept putting off the return process. So ridiculous, but there it is. The returns took us a couple of days to complete, but every store accepted them… even though there were a handful that were outrageously old. Perhaps this was because it’s January, and companies tend to be more lenient with returns after Christmas. Whatever the case, it was awesome, and we were super grateful to get that money back! Send back unworn products to brands: Same thing here. I had a stack of press/brand boxes, filled with beautiful things that didn’t fit or that I didn’t need, just sitting in our master bedroom. I kept telling myself that I’d soon get started with the donating process, but yeah: clearly hadn’t happened yet! So I went through them, and got in touch with those companies I had contacts for, and asked whether I could send back the products (or perhaps exchange them for either the correct size or something that I’d like to feature on the blog/social media). The rest was set into two piles: donate + give to readers. Do the laundry and put all the clothing in the right rooms: This is embarrassing to admit, but we were probably a month behind on laundry when we got back from our holiday travels, due to morning sickness and the flu. As my mom instructed us to, we simply let it go in favor of other more important things, like resting, sleeping, getting better, and togetherness. It was for the best! But with all the guests we’d had and the dirty bedding/towels that come from that, I did 10 loads when we returned to Chicago. TEN! The fact that we even had 10 loads reconfirmed how much we needed a change, haha! In my opinion, though, doing all the laundry and getting the clothing into the right rooms was very important, as the first step to talking the clothing category is piling everything you own onto one bed, not several. The contents of Mitch’s closet. My discard pile. I’m ashamed! This was humiliating and such an eye-opener. We did it one person at a time: first me, then Mitch and then Emma. (Emma, however, was only half involved. She played next to us if she was awake for it, occasionally helping me go through stuff, which, in reality, was far more destructive than helpful.  Really cute, though!) But I just couldn’t believe how much I owned. Again, I’d done multiple clean-outs since having moved into our house here in Chicago, but I’d never taken everything out at once to see its true physical mass. One word: YIKES. Of course, it wasn’t as black and white as I’m making it seem, because there were some things I kept that didn’t “spark joy.” For example, zero pairs of underwear made me feel joyous. Still, I need my underwear, and it’s something I get a ton of use out of. In this situation, I kept the pairs that were comfiest and that I reached for most often, and tossed my “backups”–the underwear I reach for when I’m 10 loads of laundry behind. Pieces that were worn out and shabby-looking. For the most part, these were easy to toss. Pieces that I’d once loved. When I really considered why they were still in my closet, I realized I either had considerable sentimental attachment to them or I was hoping I’d one day love ’em again. (Which rarely happens.) For example, there that blue dress from H&M that was at least a decade old. It was actually in good shape, but it was way too short, and I knew I’d never wear it again. But it was my favorite dress for years; so much so that Mitch even remembered it from our early days of dating, and it brought back so many happy memories. I wore it constantly back in my 20s! Would I ever wear it again? No. So it went in the discard pile. Hard, yes. But I truly haven’t thought about that dress again; I’m only telling you his story now for the sake of compelling narrative. ;) I have lost ZERO sleep over letting go of it! Brand new pieces, some with tags, that I’d never worn. Luckily, I only had a few of these items. But the guilt was there, for sure. At one point, I’d spent my hard-earned money on the pieces, and now here I was, years later, having never once worn them. Such regret! But I was real with myself, let that guilt go, and placed these things into the discard pile. Expensive pieces that I no longer wore. Similar to the last one, but slightly different. What comes to mind is a pair of Louboutins that I scored for $100 a few years ago at this crazy sale. I was so excited at the time, but I came to recognize that A) I couldn’t walk in them and was risking a broken ankle with every step, and B) they just weren’t me. Look at that heel height! I do, however, secretly lust after the 2.5-inchers. ;) Discard pile. Pieces I loved the idea of. For example, a leather mini skirt. REALLY CUTE. Fit great; looked great. But never wore it because I only wear skirts when it’s really warm out because I live in Chicago and the weather is freezing except during the summer and a leather skirt looks really weird in July. Discard pile! Gifts from brands. Most of these pieces were beautiful; things I likely would never own were it not for this site. Letting them go made me feel like I wasn’t grateful enough for everything: for the blog; for the once-in-lifetime opportunities it’s provided; for the ability to make a living from something so fun and flexible, and for the ability to spend more time with my children as a result; and yes, for the clothes. (While they’re certainly not the #1 perk for me, they’re an awesome perk nonetheless!) Letting these things go also made me feel guilty, and like I was letting the brands down in some way. Almost like I owed it to them to keep that purple cashmere sweater forever, even though I own literally no other purple clothing or something? I don’t know. But I let that guilt go, and placed these items in the discard pile. Gifts from family and friends. More guilt, and so many things I kept around only because of the attached sentimentality. Like, it was really sweet and thoughtful of so-and-so to buy me this dachshund sweater! But… I haven’t worn it in years. Discard. Duplicates. There’s just no other way to put this: striped tops are great, but a girl does not need to own 20 of them. So I picked my favorites and into the discard pile the rest went. Same went for jeans that looked the same, button-down shirts, little black dresses–anything, really. Unless it was something that was constantly in the wash, I decided I didn’t need repeats. Wears-once-in-a-blue moon pieces: The first thing that comes to mind is gowns. I NEVER go to balls or black tie events. Like, ever. The last one I went to was probably five years ago, yet I had several gowns in my closet from over the years. I decided to keep one, just in case, but I’m now leaning toward getting rid of it because hello, five years?! Isn’t the rule that if you haven’t worn it in the last two years, you need to unload?! Sorted and ready to go! Give to friends and family: I set aside some special things for my family (mostly for immediate family who come to visit) and friends, too. These are things I know they’ll love! I used to do this with friends a LOT more; we’d have little blog parties during which they could “shop.” But most of my friends here in Chicago are bloggers with their own closet problems ;) so that doesn’t happen as often anymore. I am starting to make more mom buddies, though, so maybe in the future I’ll do it more! Regardless, these things went into a single storage tub. We gave Mitch’s family their gifts yesterday, and we’ll give my family theirs in February when they come visit. Sell: These were things that were valuable and would probably yield high resale prices, so they went in the “sell” pile. My Louis Vuitton Neverfull MM is the perfect example; I used to use it all the time… but now that I have Emma and another baby on the way, I really wish I had the large size to accomodate all the baby gear. So I’m selling, and might reinvest that money and buy the larger version that fits my current lifestyle. (Maybe. Not sure yet.) Another example is an old pair of Stuart Weitzman shoes. While I used to get a lot of wear out of them, I just don’t anymore, and they’re in great shape. Not a super high-end designer, but they’ll probably sell quickly and for a good price. Same thing with a Kate Spade dress and a Tory Burch bag. I keep getting questions about how and/or where I sell, and I’m so happy to address that! Up until Emma, I sold via eBay, and had great success with it. It was time-consuming, but it was worth it and even enjoyable at that point in my life because I had fewer responsibilities. It also helped me fund those product buys for the blog, since it was kind of like recycling products. (Here’s the post I wrote about how, exactly, I refined my selling techniques to make–at my height of success, haha–$1,000 a month from it. I highly recommend if you’re not strapped for time right now!) I’ve never used Poshmark, only because I started selling on eBay before Poshmark existed and saw little reason to switch. But many people swear by it! These days, I just don’t have enough time to sell on my own. Believe me: I tried when Emma came along; I really did. But again, keeping up with motherhood, work and the house was a struggle on its own, and I was already short on sleep and personal time. And while I kept telling myself that I’d get to it eventually, “eventually” never came, and the stuff continued to pile up. So I finally handed over control and decided to selectively consign, whether with a company, store, or individual. And now I play tea party with my little girl instead of running a mini store of sorts or managing an assistant who does it. Yes, I make less money, but I’m happier! For a long time, I was using eDrop-Off here in Lincoln Park and it was great, but after 15 years, the owner (who also has a little girl!) recently shut the company down. So I’m now exploring different options. I can’t really recommend other consignment services since I don’t have a ton of experience with them yet, but I do really like the shopping experience at McShane’s Exchange here in Lincoln Park, and I also think Luxury Garage Sale on Wells is good. Hiring someone to sell on eBay or Poshmark is an option, too. Give to readers: That’s you! Yes, you guys got your own pile. I’ve never done this before, but in a few days, I’m going to start giving away some special products–either new or in great condition–that I’ve set aside for you. (Because you’re the reason for this blog!) I’m a little nervous about it, but I think it’s going to be successful. Basically, I’m going to list several products in blog post, and have “sign up forms” for each one. After a couple of weeks, random winners will be selected and mailed their gifts. (Whatever isn’t claimed will be donated.) Having learned from my eBay experience, and in an effort to make this easy and doable for me, you won’t be notified that you won, and I won’t be announcing the winners anywhere, either. Ha! You’ll just be pleasantly surprised if you receive a package. I know it’s not the perfect way of doing this, but I’d at least like to try it out as a way of saying thank you! Stay tuned. So yes: Everything was bagged and labeled, and dropped off if possible. Excited to get more of it out in the coming days when I start the giveaways! A second look with a more discerning eye. I found that when I first started sorting and discarding my clothing, I was keeping far more than I was toward the end of the process. Toward the end, it was seriously like “Thanks, bye! Toss!” So when I was all done, and everything was back in my closet, I did it again. And I got rid of even more, as I was looking at things with a more discerning eye. Admittedly, their clean-outs were much easier, with Mitch’s being the simplest. We threw all of his stuff on the bed and whipped through it; he was quick to discard and picky about what to keep, which was ideal. 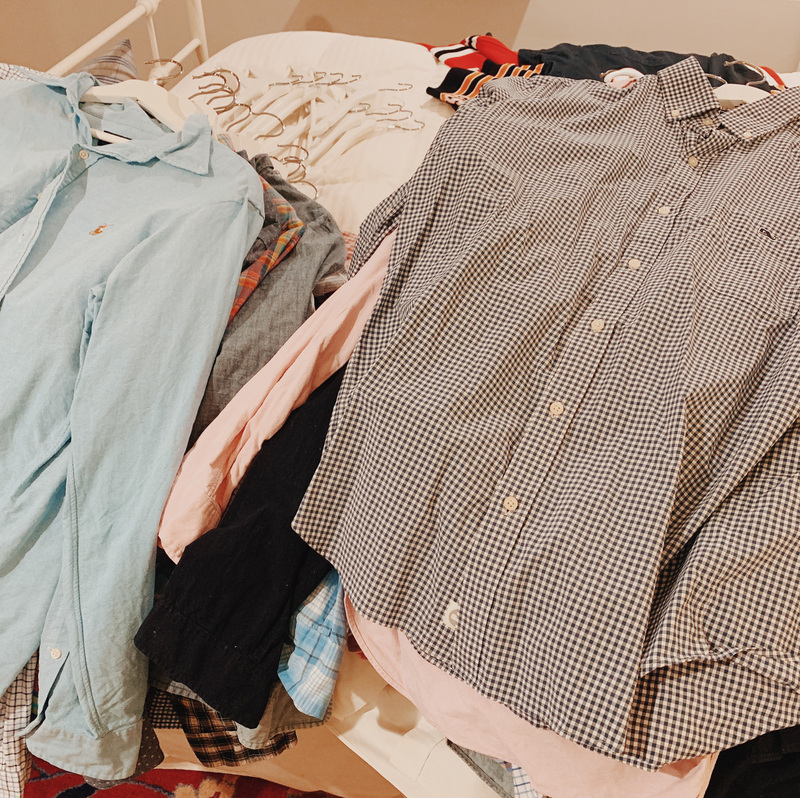 (The keepers were mostly Vineyard Vines Performance Shirts, which are his FAVE because they don’t wrinkle.) I told him all about the “nine different types of pieces,” and this was very helpful, as was actually trying things on. We learned that more often than not, it belonged in the discard pile if it required a try-on, but we did it anyway. With the exception of her Elsa dress, Emma has absolutely no sentimental attachment to her clothing, which meant no battle. I separated everything into four piles: Keep / Trash (if unsalvageable) / Donate (if too small and not a favorite yet still in good shape) / Store for Baby #2. “Keep” went onto hangers and into drawers, “Trash” and “Donate” left the building, and “Store for Baby #2” went into a tub in the storage area. Easy peasy! After the discard process, though, it was time to organize… and while we’ve made strides, we probably still have some work to do there. Next week, I’ll share an update on that, because it’ll for sure be completed then, and also this post is getting kind of long! I hung dresses on the right-hand side, stored my bags in the drawers situated the middle of the closet, hung my blazers and vests in the upper left portion, and hung my tops and sweaters in the lower right portion. (We have a spare closet in the master, so my seasonal coats went in there, and my winter coats stayed in the coat closet. Before, all my coats were kept in the coat closet, and it was a big, overstuffed mess!) The goal was to have space between the hangers, and I think I achieved that. Even though it’s not a Pinterest-worthy look, I can see everything, and nothing’s getting crushed or wrinkled anymore. In terms of my dresser, that’s where my underwear, socks, t-shirts, summery stuff, and jeans are stored. As much as being pregnant helped with the closet purge, it hurt the jeans clean-out because I felt that I needed to try them on to make decisions, which was impossible with the baby bump. But I discarded the ones I knew weren’t favorites, and I’ll revisit next fall, when I hope to be back in my regular jeans. As far as Mitch and Emma’s closets and dresser go, we followed essentially the same organizational method that I did with mine. We definitely wish we had a custom closet for Emma, because storage would be a lot easier… but silly to invest in that at the moment, when we’re hoping to move. In the near future, I hope! It took three weeks, with us dedicating no less than 15 minutes to it in the morning and 15 minutes to it in the afternoon or evening. (Though we did spend about an hour on it for a few days when we didn’t have that much going on and we were feeling motivated.) When we’d run out of time, we’d place the stuff on the floor, and then continue later or the following day. We had to step around it on a few occasions, but it really wasn’t that bad, and the ugly piles served as extra motivation. We wanted that stuff out! Marie Kondo would probably shake her head at how long it took us, but it was the best we could manage. While this is our slowest season, Mitch and I both still have to get our work done, and Emma isn’t going to stop being a kid just because we’re in the middle of a KonMari challenge! 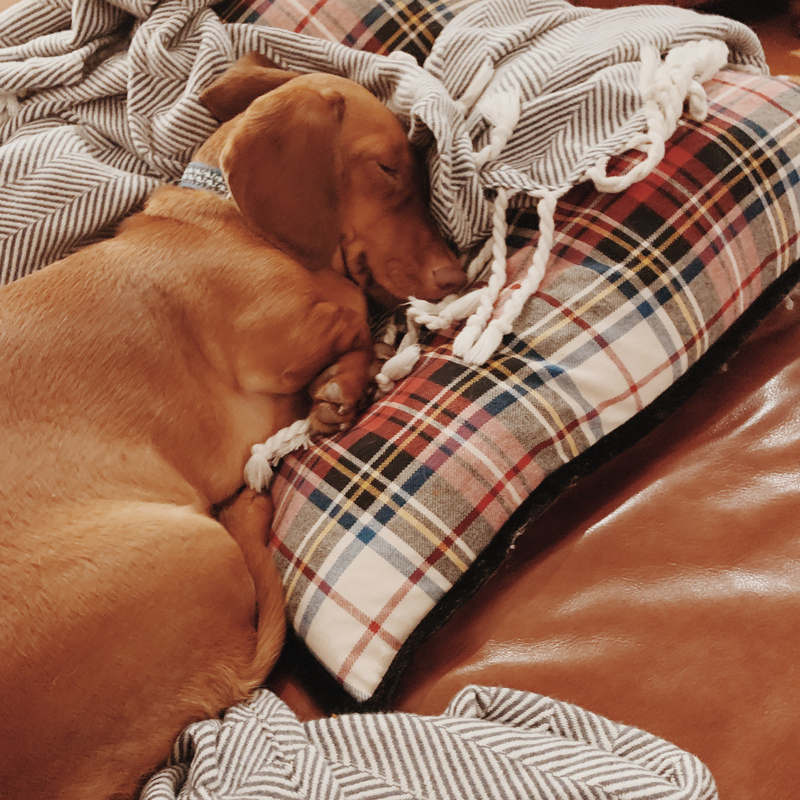 Depending on their age, children can often be more unhelpful than helpful during clean-outs, so we mostly opted to work on the challenge while Emma was sleeping or at PeeWee. It took longer, but it worked! 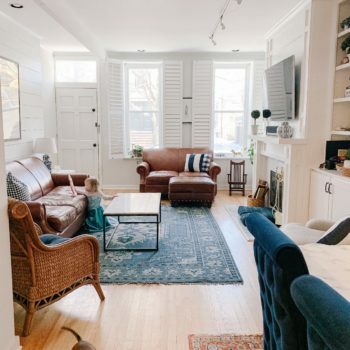 So no: For a young family, it will be very difficult–if not impossible–to complete a total home clean-out in a weekend or even a couple of weeks, like you’ll see on the Netflix series. But you will see progress and feel the effect of your work after a week, which is pretty great. Going back to the bathroom story, our biggest takeaway from the first phase of our KonMari challenge has been the importance of mindfulness. Yes, much of what we discarded and tidied was gifted to us via the blog, but that doesn’t really change anything. It’s still consumption, and it’s consumption of things that we don’t actually need. While I love reviewing new product lines, it’s important to find loving homes for those products if they arrive in large numbers. ;) A girl does not, after all, need 10 pairs of black flats. The first phase was also further affirmation that few things bring real joy to our lives. Instead, they tend to detract from our happiness and direct our attention away from that which is truly important. I don’t think I ever really thought that a pair of shoes, for example, could make me a happier person–especially now that fashion is so intertwined with work for me. (If anything, I think I now value material things way less because of the blog and my constant exposure to consumerism. Need to write about that soon; it’s something I haven’t talked about yet!) But I also don’t think I realized how unhappy having too many pairs of shoes could make me. This is not to say that I don’t still enjoy blogging about fashion. I really do! I like fashion. There just needs to be less infiltration of it into my home, where so much of the rest of my life takes place, if that makes sense. Seems like a stretch, but since having ditched the majority of my closet, I feel lighter, too. And like I’m starting to live the lifestyle I’ve wanted for a while now. A simpler one. I think that unbeknownst to me, clutter was impacting my productivity and leaving me in a constant state of feeling overwhelmed and behind. I just always, always felt like a hot mess, unable to keep my head above water, living in a messy home that didn’t inspire. Like a failure, almost. 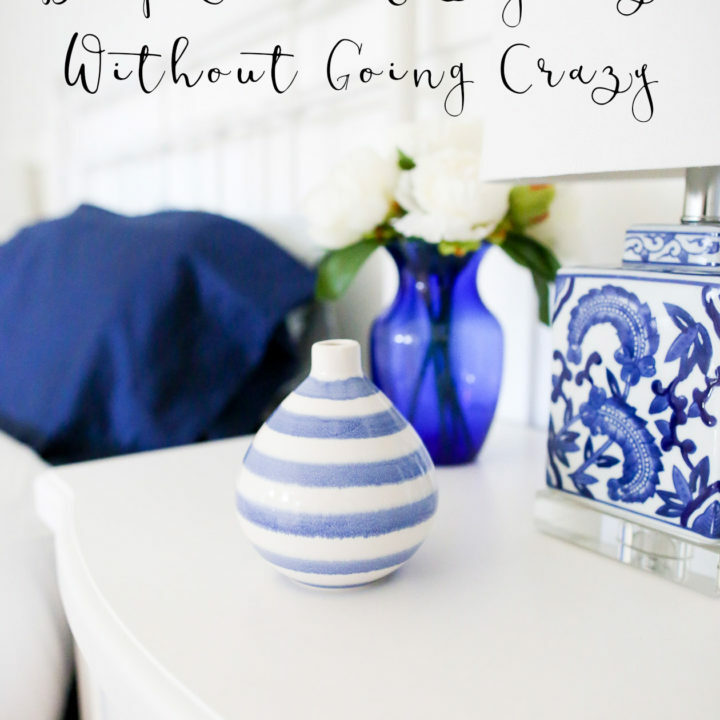 The moment I removed the clutter–and just from our closets so far!–I felt more put together, and things became easier. First, the rest of the house seemed easier to tidy and take care of. I was more on top of it. And on the wardrobe front, getting dressed became fun again. Before, I usually reached for whatever wasn’t wrinkled or whatever was in plain sight within that overstuffed closet of mine. I had so many options, yet I was repeatedly grabbing the same stuff! On the personal front, I now feel excited when I open my eyes in the morning. This is going to sound a bit sad, but waking up amongst clutter was deeply affecting me. When it was time to get out of bed, I dragged my feet, feeling utterly overwhelmed by the day ahead. I’d think about a single task–very easy to accomplish on its own–and shut down. There were a zillion other things I had to do; how could I possibly focus on a single one?! Because of this, I’d often accomplish very little in a given day. And thus the perpetual feeling of being behind. Because I’m more focused and productive, I now get more time with my family and friends, too. Like, I can do stuff again. 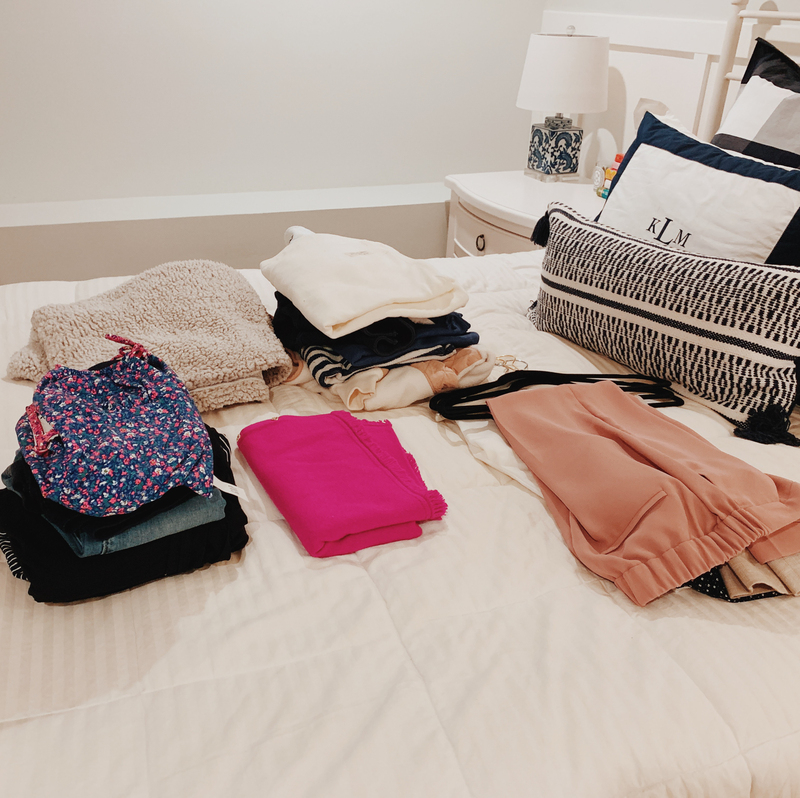 Before the first phase of the KonMari Challenge, my nights were spent catching up from unproductive days, and I felt guilty about doing things for myself or even having fun. I kind of felt like I didn’t deserve it. And while I still have an unproductive day every now and then or a night during which I must play the catch up game, I have a LOT more free time, which I’ve chosen to spend guilt-free with the people I love. It’s really wonderful. For example, I was able to take Emma on three different adventures this past week because I was relatively on top of things. It was the best! And all of this, of course, has positively impacted my marriage, which is undoubtedly the most important part and the foundation of my life. Mitch and I love working together at home and have a good time doing it. (So many laughs, and I love building something that is ours together. It’s definitely right for us.) But it’s unbelievably awesome to be able to turn it off at a certain time every day and go and have fun that’s completely removed from work. I don’t know if you’ve noticed, but we sit down to watch movies and shows together way more often these days. (We’re captives after 7:30 p.m., so it’s the most we can do without a babysitter, but still awesome!) We try new things for family dinners, and we’re going on a real vacation next week! Those are just a few little things, but little things add up and make a big difference in our happiness. We’re totally on board. If you’re still reading (hi! ), I’m sure it’s clear that we have seen noticeable and drastic results just after Phase I, and our lives have changed for the better. I also haven’t lost momentum. 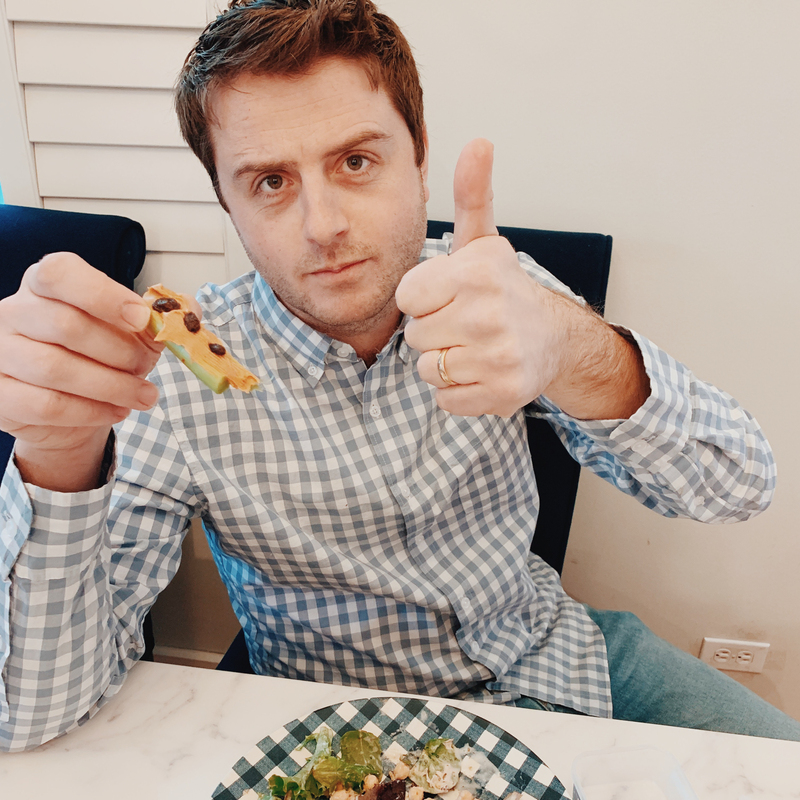 I admit that I was wrong, and like Mitch, I’m excited to move on to the next category! Given the field that I’m in, it’s unrealistic to think that packages will never arrive on our doorstep again. They’re going to keep coming; it’s more so about coming up with a plan for how to handle them. We’re making far more careful decisions about our purchases and also what gifted products make their way into our closets as semi-permanent guests. Do we really want to add another button-down to the collection? Another pair of shoes? Another dress? Sometimes, the answer will be yes, and that’s okay. To be as transparent as possible, I make a large part of my income from featuring and reviewing the newest styles, and I’m not going to stop doing that. (Though I am relying more on basics, as that’s what I find myself gravitating toward anyway, and it requires fewer seasonal product buys). In general, though, something old must go out when something new comes in, whether the “old” is donated, given away, or sold. One in, one out! Because we only wear our favorites, we are now more apt to identify pieces we aren’t wearing and discard them. Before, my closet was a black hole. Who knew what was going on in there?! Mass chaos and kind of scary. Now, though, I can see everything, and I take note of what I’m not reaching for. Sometimes I’ll force myself to wear one of those things, and if by the end of the day I decide that it’s not comfy enough or it doesn’t make me feel great, I’ll discard it, and put it into one of the piles. Only favorites. Speaking of piles, we’re allocating tubs for that which we discard. They’re in our storage area, and they’re clearly labeled: SELL / DONATE / GIVE AWAY / FAMILY + FRIENDS. Super easy to drop things in! When they’re full, we’ll drop them off/take care of them. We’re cleaning out Emma’s closet seasonally. We weren’t doing this before, but we’re starting now. The little girl grows so quickly; it’s important to stay on top of her clothing so that everything in her drawers and hanging in her closet actually fits! Taking a short break with “ants on a log,” and then back to work! One question I keep getting is how we’re staying motivated. Three months is a long time, after all! Granted, we’ve only been doing this for three weeks, but we really haven’t lost steam. Mitch and I began talking about doing a KonMari challenge a couple of months before we actually started it. We both feel that this was–and continues to be–invaluable in motivating ourselves to keep going. We talked about it constantly, and how much the change would likely positively impact our lives. By the time the holidays were over, we were itching to get started and see the project to its completion! Having Mitch on board has also been of the utmost importance. Frankly, I’m not sure I’d still be doing it if he weren’t just as dedicated as I am. I should mention, however, that he has no plans of reading the book. But that hasn’t been an issue! I’ve simply filled him in on it, and in the beginning, I sent him some awesome articles about how the KonMari Method has transformed lives like our own. It honestly didn’t take much convincing! He was game almost immediately. But yeah. I know it’s a fad right now, but watching a couple of episodes is probably worth it! Thanks for reading, and sorry for the novel! We're Going to Marco Island!